More and more people are meeting one of our most recent invasive pests, the Brown Marmorated Stink Bug (BMSB). It had spread to at least 29 states since it was introduced in a shipment to eastern PA sometime during the 1990s. They were first collected in Allentown, PA, in 1998. 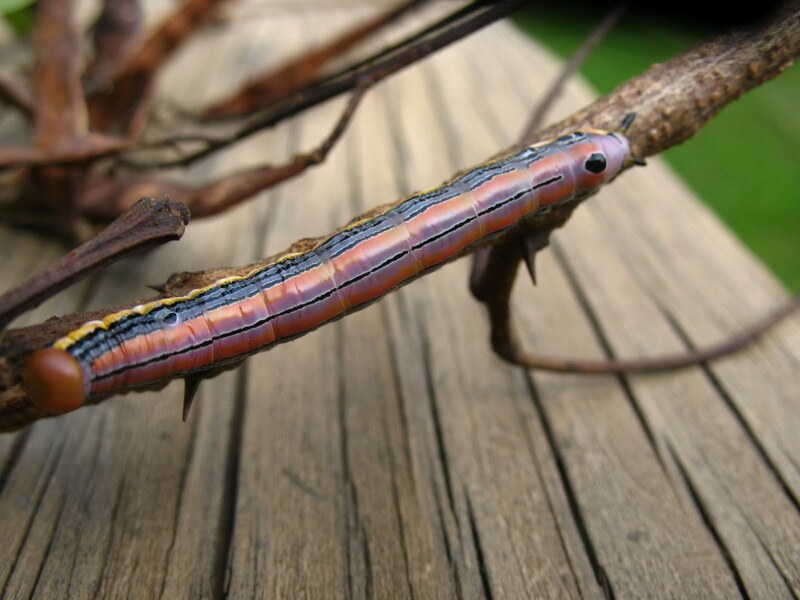 BMSBs are a major agricultural pest in Asia, feeding on fruit crops and their population in the US has reached numbers to make it a real problem to American orchardists, too. They don’t eat entire fruits or even make them inedible. They disfigure hundreds of individual fruits – like apples – so that they cannot be marketed for fresh fruit sale. Instead these apples and other fruits can only be used for cider or juice. Now that spring has arrived (in most of the country, anyway) we will be seeing more adult stink bugs waking up from hibernation in our homes. Our family flushes all that we find so they don’t stink up our vacuum cleaner! I have been wondering, lately, if they could be used for anything else…say a food source for something. I happened upon a forum today with some interesting ideas for “disposing” of BMSBs. 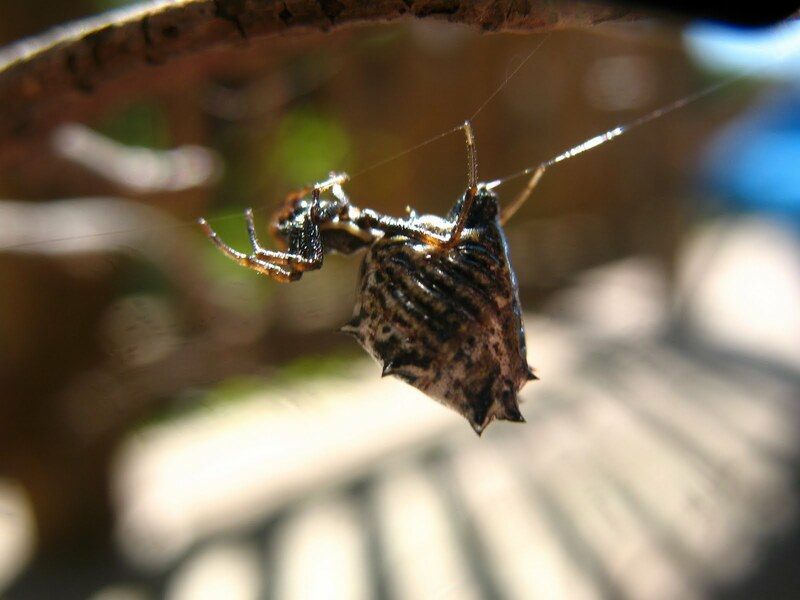 Here’s the link: http://forums.gardenweb.com/forums/load/pagard/msg101628188305.html; the discussion thread is called “Fun Organic way to Deal with Pesky Brown Stink Bugs.” I particularly like that one person’s pet turtle loves them! I’m considering catching some in a jar, freezing them and feeding them to our chickens. I’ll let you know if they eat them! 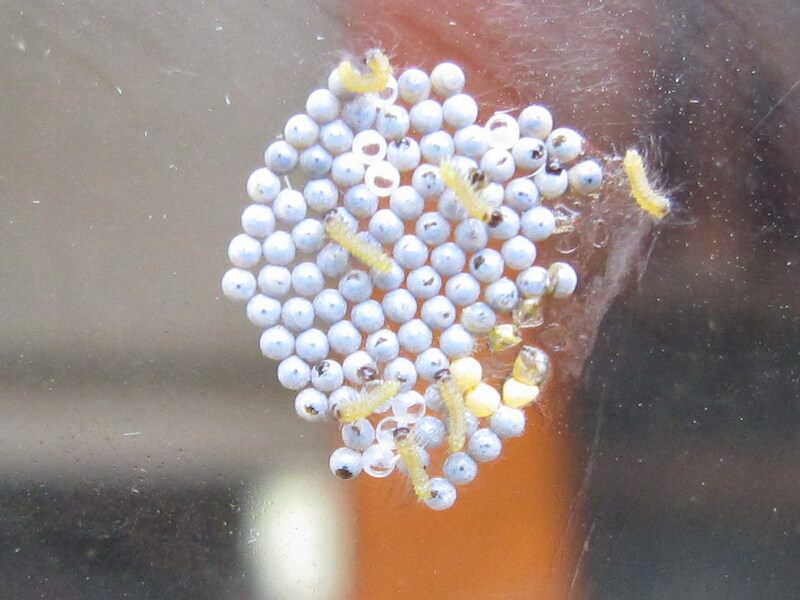 If we educate ourselves to the different stage of the BMSB, we can work at reducing their numbers – from egg stage to adult! Yesterday was the first time we’ve seen a coyote around the house. We always knew they were around, especially after we lost a bunch of turkeys and had a sheep get attacked a couple years ago. During the snow storm yesterday around 1pm Dave saw a coyote run across the pasture. He took this picture from Noah’s bedroom window. This week has been sunny and warm…and busy! Dave stayed home with us on Monday and Tuesday because he had just finished a big project at work last week. On Wednesday, my dad came up to spend some time with us. We always love when he can visit because we don’t get to see him as much as we’d like. We spent so much time outside enjoying the weather that we saw lots of wildlife and made many new discoveries this week. Dave worked mainly on cutting up the Locust trees that fell in August on his days off. While working on the tree out front he found this pretty caterpillar. I researched it online and found that it is a Black-Spotted Prominent caterpillar (Dasylophia anguina). One of their host plants is the locust tree. I took out my tomato plants on Tuesday because they had become affected by late blight, a fungal disease. This year I tried a lot of different heirloom varieties in the garden and I found it interesting that the late blight affected the heirloom tomatoes worst than the hybrid grape tomatoes in the same bed. 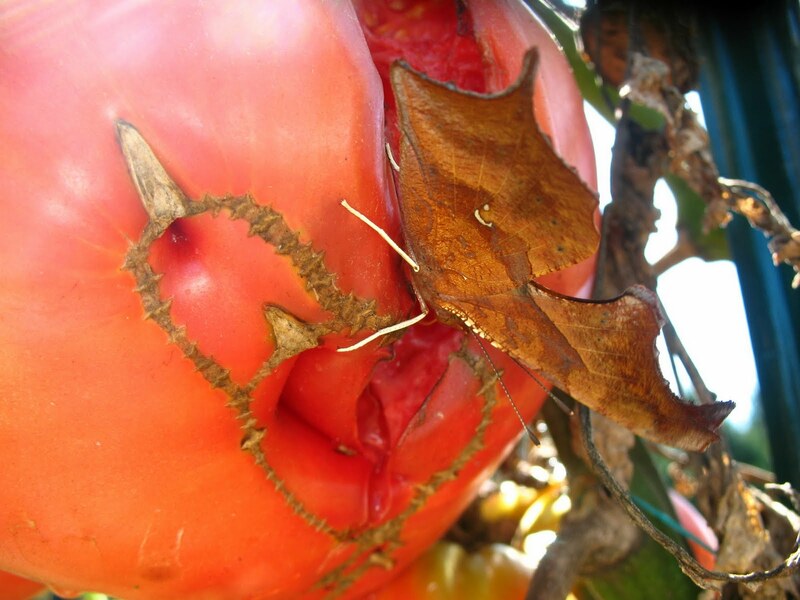 Some of the Brandywine tomatoes were actually rotting right on the vine, which attracted butterflies! I got some good pictures of a Question Mark butterfly (Polygonia interrogationis) feeding on a tomato. 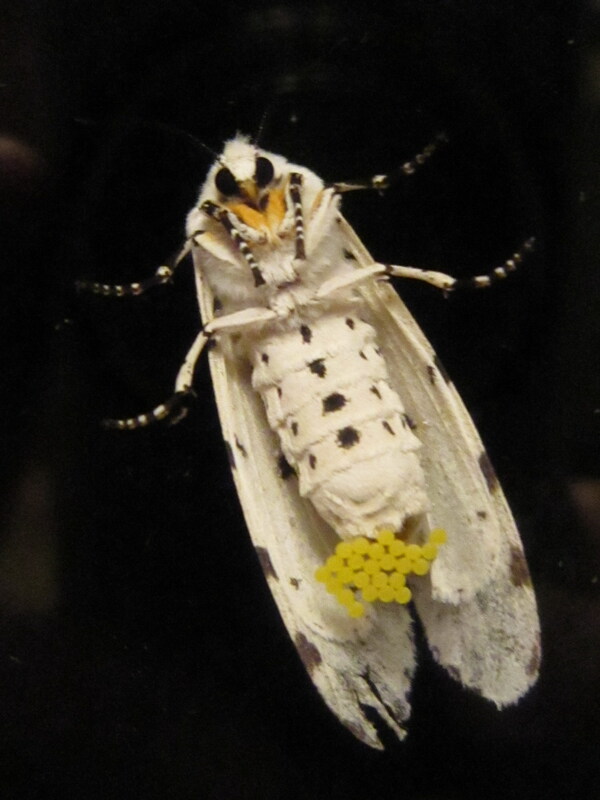 The different markings on the inside and outside of its wings are amazing. With its wings closed the Question Mark looks just like a brown leaf, but when the wings open they reveal beautiful brown and orange markings. In the fall the butterfly develops a violet margin on its hindwing. Another fascinating new bug, er spider, I found this week was a female Spined Micrathena (Micrathena gracilis). She is very small and has a web near the lower part of our deck. I first thought there was a parasite or growth on the spider until I looked closer and realized its abdomen is very large and spiny. It was very calm and let me photograph her easily. These interesting mushrooms are growing in my perennial garden near my rose bush. They are about 4″-6″ tall, yellow-orange in color and have a slimy, black substance on the cap. 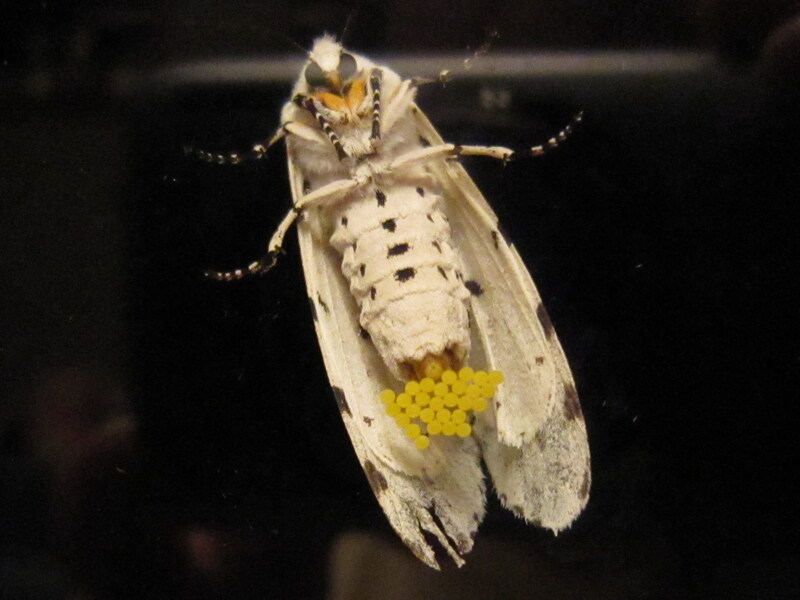 They seem to only last a day, appearing in the morning and shriveling up by evening. 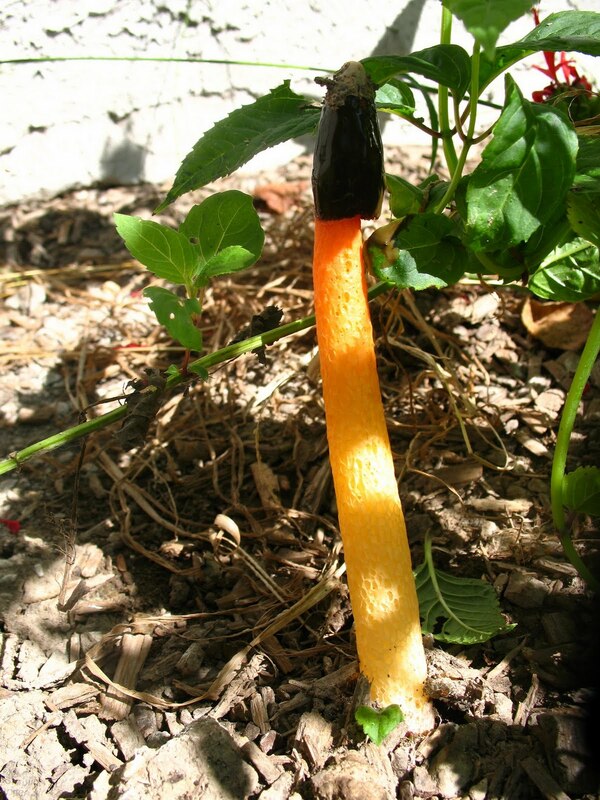 After some research I found that it is a Stinkhorn mushroom (Phallus rubicundus) and it’s frequently found in mulch and wood chips. Its spores are in the slime, which attracts flies, etc. They get the spores on their bodies and transport them to new places. Yesterday I took Noah and Hannah for a short walk up to the road. There were lots of vultures circling above…probably checking out the field across the road. Our neighbor cut hay on Wednesday and some vultures were following the tractor all day, probably hoping for some casualties. 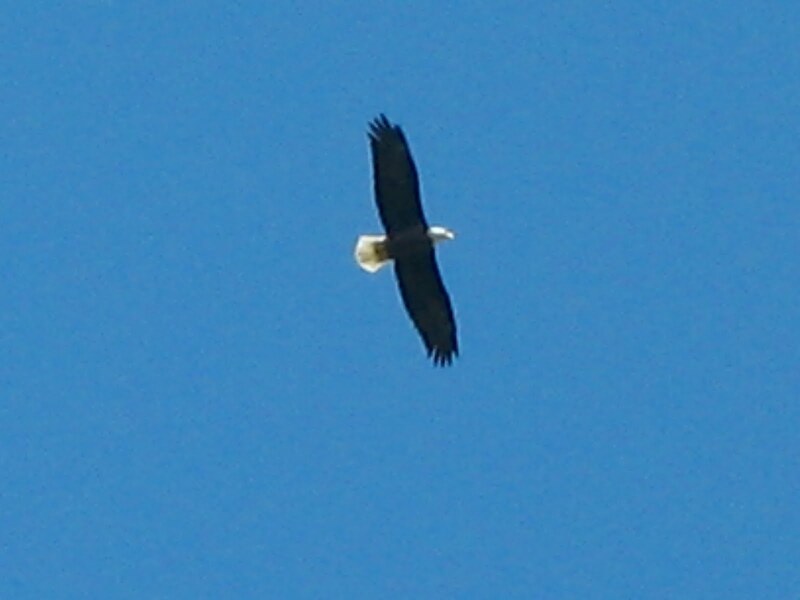 Anyway, among the vultures was a Bald Eagle! I pointed it out to Noah and he thought it was cool. I hope you enjoy all the photos. We had fun exploring and photographing around our little farm.